There are 419 imperiled plant species in North Carolina tracked by the Plant Conservation Program (PCP), housed in the Department of Agriculture and Consumer Services. The imperiled plant list includes species deemed special concern vulnerable, threatened, or endangered in North Carolina. While many of these species live in hard to reach places such as mountain balds or coastal wetlands, others are among us. There are currently 31 of these species living in Durham, Orange, or Wake counties and over 130 across the Piedmont in North Carolina. A notable species in the Triangle is the smooth coneflower (Echinacea laevigata), a state and federally endangered species. It is kin to the purple coneflower (Echinacea purpurea), a very common perennial found in nurseries and home gardens. These two species look similar, but the smooth coneflower’s stem is glabarous (not hairy) and its petals tend to be paler, narrower, and a bit more droopy. It blooms for a few weeks in June and July. 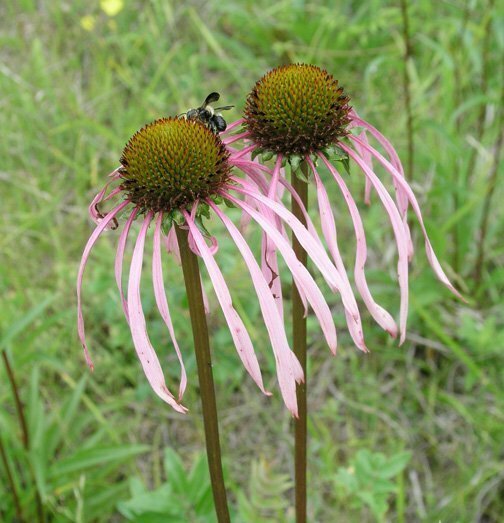 Smooth coneflower populations have declined dramatically from their historic range of six North Carolina counties to now only Durham, Granville, and Mecklenberg counties. In the wild it is limited to alkaline soils derived from igneous rock intrusions called diabase. Relatively small pockets of this soil dot the Piedmont’s more acidic soils. Farming, development, and forest re-growth are the main reasons why this flower is so rare. This species alludes to a past unlike what we see today. Many parts of the Triangle were savannas of mixed hardwoods and short leaf pine. Glades, meadows, and small prairies kept open by periodic fire and herbivores separated the wooded streams and bottomlands. Other sun-loving North Carolina rarities exist in these habitats such as hoary puccoon (Lithospermum canescens), glade wild quinine (Parthenium auriculatum), Michaux’s sumac (Rhus michauxii), and tall marshallia (Marshallia legrandii). Conservation efforts began when botanists noticed prairie remnants on roadsides, farm fields, and utility right of ways. Organizations followed by establishing preserves. Much of this preserved acreage is in the Triangle’s backyard, just north of Durham in the PCP’s Eno Diabase Preserve. The 350 acres are a part of a larger partnership with the North Carolina Botanical Garden, Eno River Association, and the U.S. Army Corps of Engineers. Ecologists have begun restoring the prairie and savanna-like structure by removing trees and initiating a prescribed burning regime that creates favorable light conditions for the smooth coneflower and other rare plants. These actions will expand habitat and encourage growth away from roadsides where they are vulnerable to mowing, salt spray, and herbicides. Conservation practitioners stress the importance of leaving native plant populations in the wild. This approach helps to preserve the genetic integrity of the rare species and maintains these in their natural context. The North Carolina Native Plant Society and the North Carolina Botanical Garden are among organizations that list sources for nursery-propagated native plants. For those wishing to learn more about these species and the Piedmont prairies, consider taking the Piedmont Savanna Ecology Course, periodically offered at the North Carolina Botanical Garden in Chapel Hill. The stewardship of these special places is an ongoing concern. If you are interested in helping care for these preserves or in joining workdays or field trips, contact the Friends of Plant Conservation at ncplantfriends.org. David Welch is the North Carolina Plant Conservation Program Administrator, housed in the Department of Agriculture and Consumer Services Plant Industry Division, Plant Protection Section in Raleigh.